My interest in pro cycling bottomed out last summer, but Get Your Grand Tour On has completely revived it. Inspired by David Rees's brilliant Get Your War On -- brace yourself for sarcasm and obscenity. Speaking of cycling: last weekend I took my vintage 1987 Hardrock on a trail for the first time in 15 years. 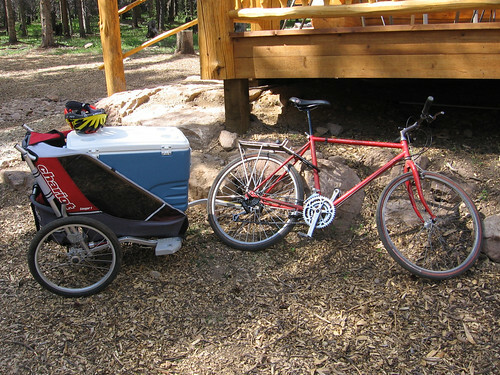 The 40 pound frame and classic 80's geometry (slightly downsloping top tube) make pulling heavy trailer loads a joy. In the background is the 10th Mountain Division Hut Association's newest hut, just west of Tennessee Pass (3117 meters).